National Go Skateboarding Day is a day to head out in the sunshine and have a good skate with your friends. This annual celebration is aimed at promoting skateboarding and getting people motivated to take part in the sport we all love so much. Contests and fundraisers will be being held around the world. A lot of you will read this and wonder why only one day, why not skate every day? We totally agree, skate every day for sure! But the big drive of this day is to get the people whose boards are at the back of the wardrobe to dig them out again. Go for a push around town and remember why they bought a skateboard in the first place. Here in Brighton we are lucky enough to have 10 skate parks within a short distance. This means you’ll never get bored of the park scene around here. The area offers more street spots than you can master in a lifetime. Ocean Sports is lucky enough to be part of this scene, sponsoring contests and hosting events. At Board riders we stocking decks and components from brands such as Independent, Lovenskate, Spitfire, and Bones. It's great to get kids involved too, we stock children's starter skateboards . Complete skateboards in a full range of sizes. Whether you're just starting out in skateboarding or you're near on pro, we'll have a skateboard for you. Limited edition special run skateboards, cheap sale price complete skateboards and new latest season release skateboards too! 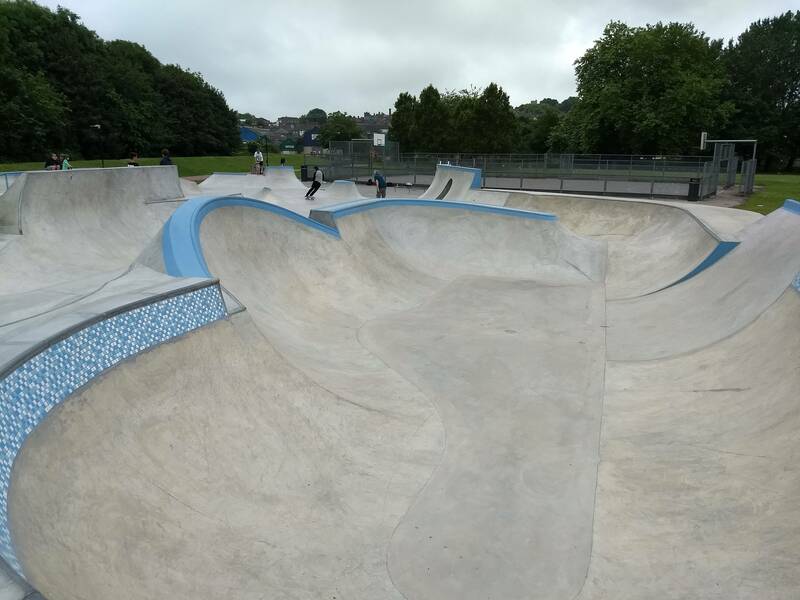 This entry was posted in Events, Skate News and tagged Brighton, skateboard, skate event, complete skateboards, hove on June 15, 2017 by BRG Blogger. Board bags from £35.99 - Whether you're going for a planned break or a last minute get away, we've got a whole host of Snowboard bags and cases to carry your gear in style. We have Wheelie board bags and standard snowboad bags in all board lengths. Dakine and Burton offer top quality, durable board bags that last season after season. Snowboard bags from just £35.99 available in our store or online. Fast free delivery too! If you want something subtle or a bag that stands out on the conveyor belt we've got you covered! We stock well known Snowboard bag brands Burton and Dakine, take a look here! We have in stock three main types of snowboard bag, board covers which just offer a cover for your board, padded board bags that offer brilliant protection and are essential for traveling and finally wheelie padded board bags, these are great for transporting your board around the airport terminal easily. This entry was posted in Snowboarding News and tagged Burton, Dakine, snowboard, Snowboard Bags, snowboarding, snow sale on January 17, 2017 by BRG Blogger. Inflatable SUP or Hard Board – that’s the question..? are far outselling hard boards in the UK because of some serious practical benefits that don’t leave you feeling like you are missing out on some hard board fun. So when you book your summer sun, just add an extra suitcase and now you can Paddle board around the world! on the water with 8-12 minutes at a leisurely pace. This pump is the best in the business and can get that board inflated to the desired PSI in no time for a cruise or surf. If you own an 11ft hard SUP board then it will always be 11ft, the travel bag that the Red Paddle inflatable comes in can live under the stairs, corner of the garage or keep it in the boot of the car so you are always ready. These options make paddle boarding way more accessible for people without outdoor or garage storage, as all you need is the same space as a suitcase. Also you don’t have to deflate every time you use your board if you can get to and from the beach or storage is not an issue – just leave it inflated for the season and deflate when the weather turns… We have had customers that have never deflated their boards since the day they bought them. The nature of an inflatable board is to sit higher in the water and have more buoyancy, which means they are perfect for the family as a couple of kids can go out on the water, you can take the kids out or even the dog! The soft and super durable construction is suited for kids, rather than the unforgiving construction of a hard board, the last thing you want to happen is the kids getting bonked on the head with a hard board. There isn’t any need to be so precious with an Inflatable SUP on land either, whereas hard boards can easily get dinged on hard surfaces if the kids get hold of them! Durability – How strong is an inflatable board..? stocking, selling, paddling and loving these inflatables. These indestructible boards are perfect for a long term purchase for the entire family to go and use without any worry. With an inflatable board sitting a little higher in the water, if you go for a board with that little extra volume for the family, then they are perfect for a couple of kids to go out on the water or take the kids out with you. made the mistakes back in the day that some leading brands are still making today. Clever innovations like the 15% lighter MSL construction, wheeled travel bag, the amazing Titan pump to all products being designed for airline travel make them always one step ahead of the rest and especially suited to what the UK market wants. With the phenomenal success of inflatable paddle boards many factories in the Far East that make other inflatable products have jumped on the band wagon and started producing SUPS, they look similar and feel similar – its only when you try one you will realise the difference. One way of making an inflatable SUP cheaper is to use one single layer of construction – this reduces weight, durability but also stiffness which means it will be like standing on a banana as soon as you are on the water and it could be easier to puncture. This entry was posted in Surf News, New Stuff and tagged Brighton, boardriders, hove, oceansports, trysomethingnew on July 29, 2016 by BRG Blogger. Surfing has been around for hundreds of years, for many a past time to get out in the water and have fun. We are lucky enough to have beaches all over the UK that enable us to take part in such a sport! As part of our try something new week, we spoke with local surfer Morgan to see why she loves the sport. What made you want to surf? I wanted to surf because my dad would go surfing and not see any teenage girls, so I saw it as a challenge to give it a go. I love surfing because it gives you a feeling like no other, its almost a stress relief and really helped me during my exams at school. Any advice for those wanting to give surfing a go? To someone that wanted to surf I would say, enjoy yourself. Everyone has to start somewhere and the more fun you have the better! If you think its something you would like to try pop into our shop and speak to a member of our team that will happily put you in the right direction. This entry was posted in Surf News, New Stuff and tagged surf, Surfing, oceansports, Boardridesguide, try something new on July 28, 2016 by BRG Blogger. Yoga and surfing go hand in hand and with paddleboard becoming evermore popular, yoga and paddleboarding go hand in hand too! The 16th July saw Roxy and a fair few yoga, paddleboarding and running enthusiasts descend on Fistral Beach for the Roxy Fitness Challenge. What made you want to take part in the event? Do you take part in Yoga, Running, or Paddleboarding and if so why? All people are different and that is amazing, it makes us unique and special. But I tend to fall into the "easily bored" category, so my physical routine consists of mixing up yoga, running, group exercises or long walks. I was lucky to have the opportunity to practice yoga with local teachers and founders. I particularly enjoy outdoor yoga, being in such beautiful surroundings, it's like the sun, wind and sound of the ocean takes you to the only place where life exists at that present moment. Running for me is “need to think" time, time when I can reflect on what has happened during the day and a time to let things go. At the Roxy Fitness Challenge event, I took part in yoga and running. I'm impressed with paddleboarding but haven't tried myself yet. It's on my TO DO list! What advice would you give to other women wanting to take part in Paddleboarding, Yoga or Running? I think it's important to keep your mind stimulated, clear your mind and help you to see the bigger picture from a different perspective. A yoga mat is the safest place to succeed or fail, but you have to be open for that, open to falling and getting back up whether its physically or emotionally. Every woman should honor their bodies with these activities; all they have to do is show up and try their best. Grow and most important have fun! We've even got some fab Roxy fitness bits in the shop and soon to be online! Ideal for running , yoga and even paddleboarding! Check back to the site. This entry was posted in Events, Surf News, New Stuff and tagged Ocean Sports, Surfing, hove, Roxy Fitness Challenge, paddleboard, yoga, running, Newquay on July 27, 2016 by BRG Blogger. "Brighton Youth Centre Skate park makeover"
Brighton Youth Centre have just finished the makeover on their indoor skate park and it looks awesome! There is a range of sessions in place throughout the week and a girls only session on a Thursday evening at just £3. From 6.30pm - 9pm, whether your new to skateboarding or have skated a few times, pop down and have a look. There is a real friendly atmosphere and staff on hand to give you some encouragement and tips. For more info check out the girls Facebook page, Sheshredders. Or if you are just looking to go along to a session, check out their website Brighton Youth Centre to see the range of time slots available. Vans 50th Anniversary second drop of goods! To celebrate Vans’ 50th Anniversary, Vans have released the second installment of their anniversary collection. With some of the largest names in Skate and BMX, the Vans Pro Classic collection are the same loved shoes we’ve seen over the years. Vans have just added some of the performance features that we see today! Features include supportive Ultracush HD sockliners for that ultimate comfort and Duracap protection in those areas that are prone to wear. Starting with 1983, the SK8-HI PRO. Christian Hosoi's style, raw power and larger then life persona took skating to a soaring global popularity. The Sk8 Hi Pro's feature the classic checkered design and upgraded cushioning and durability! Keeping with 1983, the Vans era Pro celebrate Eddie Fiola, one of the first Freestyle BMX legends! Fiola dominated the sport to give it the recognition it has today! Features include Ultracush HD sockliners for additional comfort, Pro vulc constriction for more boardfeel and flex and Duracap underlay to withstand the abuse. Known as the Iron Man of freestyle BMX, Denis DMC McCoy began competing pro in 1986 and ever since has pioneered the sport! This is the most iconic colourway of the 80's and features the comfort and durability you would expect today. And finally the Vans Sk8 Hi Pro 87'. From the Santa Cruz team in the 80's to the Black Label in the 90's and Anti Hero today. Jeff Grosso's two tone Sk8 Hi has been modernised with upgraded cushioning and durability and of course re christened as the Sk8 Hi Pro 87'. This entry was posted in Skate News, New Stuff and tagged skateboard, Boardridersguide, van, 50th Anniversary, Collection, Ocensports on June 17, 2016 by BRG Blogger. Don't forget, this Sunday why not treat him to one of our cool t shirts, some sunnies or a fab pair of boardies! And it doesn't stop there either! We've got rash vests for those surfing dads, skate accessories for the old skool skater or snow bits and pieces for the dad that loves the mountains! We've got FREE DELIVERY at the moment too!! So if you can't pop down to the shop, just order online and will get the postman to drop it to your door...simple. It's that time of year to bring the feet out and slip them into something comfy and good news, the Sanuks are here hooray ! We've added a few new styles to our collection for example the Sanuk Womens Yoga Sling 2. These will provide your feet with a bit more support than the normal flip flop design as they offer a stretch of material over the top and round the back of the ankle. What we love about the Sanuk range is they are super comfy, lightweight and if you're on you're feet all day you can do so in style and comfort! For the men we also have the Sanuk Vagabond shoes. These are constructed of a canvas upper, and feature a antimicrobial additive footbed to reduce the odour causing bacteria, lovely! Never heard of Sanuk before then check out their story below! This entry was posted in New Stuff on June 9, 2016 by BRG Blogger. Spring Break Kaunertal, Austria 2016 | Just when you thought its time to pack up your snowboarding kit, with all the snow clearing the peaks of Europe, there’s always one annual trip that must be attended, the ‘Spring Break’ UK snowboard test is the last call for those final laps in the sun! Held just an hour’s drive from Innsbruck within the Tirol valley resort of Kaunertal / Austria, lies the Kaunertal glacier awaiting the arrival of 300 folks from the UK. Here industry riders, brands, shops staff and regular snowboarders gather to test and ride all of next season’s kit from boards, boots, and bindings as well as a whole heap of cool kit. Now in its tenth year the ‘Spring Break’ is as memorable as ever, friends are made, good times are shared as the UK snowboard community bands together for 7 days of spring fun shredding! Being my third trip, I’d now like to think of myself as a ‘Spring Break veteran', I’ve shared this trip with many others, for whom too have now revisited this stunning area of Austria. This time id brought along my friend ‘Alex’ who was visiting his first mountain range after just a few trips at the indoor snowdomes. So I knew this trip would be really good to get a wide variety of kit tested from beginners to higher end models. Traditionally ‘Spring Break’ is thought to feature slushy, clear riding conditions, yet due to late heavy dumps of snow after the season’s end our experience was anything but! Experiencing every condition imaginable 3000m up was quite an ordeal, from heavy snow storms, bad visibility to a lucky clearing of sunshine breaks on our last day; we were put through it all to enjoy what was available to us. Yet when you have just three days of riding and kit to get through, there’s no time to pack up and go home! When the conditions did improve some great powder riding was had as well as the odd cheeky jib session on great little hit areas around the glacier. With 10 runs available this isn’t about the mileage, you get on a set up and if your liking it you might just want to spend a little more time getting to know it better… and if you don’t you’re never too far to go back up to camp and change your set up. It was great to finally test out some kit I’d missed from this year’s order, now covering our stores whole catalogue, to give you a taste of what we’ll be having in stock for the 2016/17 season. From brands such as Anon, Burton, Capita, G.N.U, Lib Tech, Union and Salomon, there were so many surprises and we can’t wait to share these with you soon! Check out the edit below of what I got up to, with product reviews to come during pre-season, this is surely going to be another awesome season to look forward to! This entry was posted in Events, Snowboarding News and tagged snowboard, snowboarding, boardriders, spring break, Austria, oceansports on May 13, 2016 by BRG Blogger.